Living in a country where the sun plays hide and seek most part of the year definitely makes you cherish summer on a whole new level. Some people can’t seem to understand how we can endure the cold, dark winters here up north, but if you’ve ever experienced scandinavian summer at it’s best, you know why. Of all the places I’ve traveled to, never have I experienced anything more beautiful than Swedish summer! IDA SJÖSTEDT lace dress. HÉRMES bracelet. 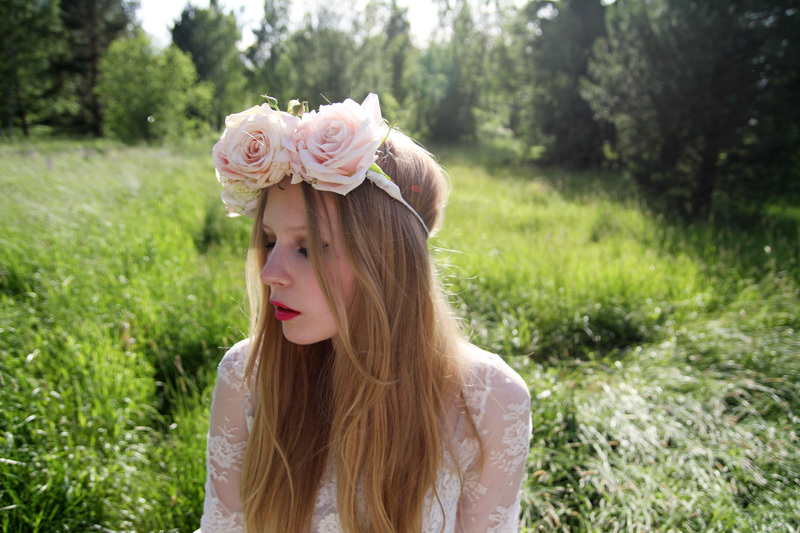 FLOWER CROWN made by super talanted florist Petra at Essinge Blommor. 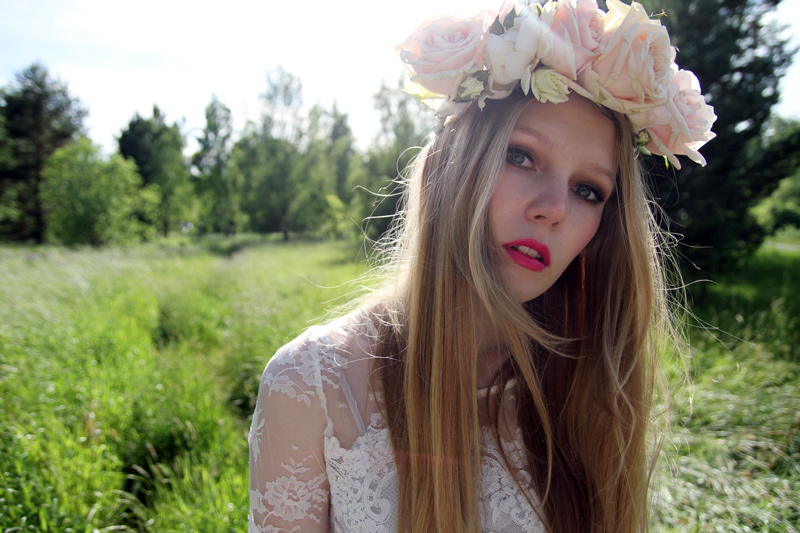 This entry was posted in Outfit and tagged flower crown, Ida Sjöstedt, midsummer, Midsummer's eve, rose crown, swedish summer by Carolina Engman. Bookmark the permalink. So so beautiful! Love this Look! beautiful! I’ve only been to Sweden in December, loved it anyway, but I wish I could go there right now. Gorgeousness!!! You look like a boho princess. Wonderful pictures! Love your lace dress! 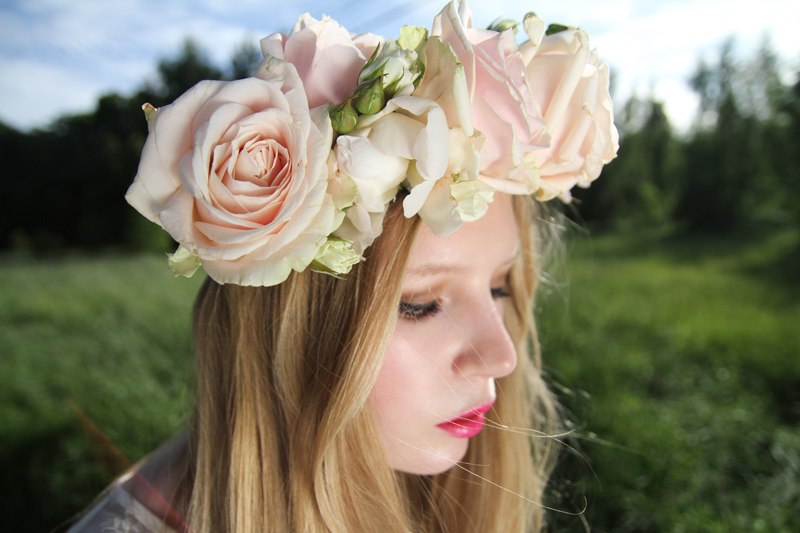 This flower crown is amazing! Midsummer’s Eve sounds amazing! You look lovely. Gorgeous lace dress and I adore that flower crown! These pictures are stunning, you look really beautiful! Perfect dress for the occasion! So beautiful! The dress and the flower crown are amazing! I’m dying! you’re sooo pretty! everything is amazing, from the headband to the outfit, but most of all the words. I’ve experienced one of those full days and full nights and all i can say is that both are amazing, and can’t wait to live in Scandinavia again. Beautiful shots of you and a gorgeous dress! i love your flower crown! so perfect for summer! This is OH SO PRETTY!!!!! I adore the flower crown! You’re beautiful! The floral crown and the sleeve detail on your dress are so wondrous! Wonderful pictures! the flowers over your head look really nice I hope you had a great day. so amazing!!! LOVE your flower headband!!! So lovely! I love your dress and the floral headpiece! Gorgeous! Hope you had a wonderful day. Really lovely photos apthe flowers on your head are marvellous! You look so beautiful and ethereal! Like a fairy bride! Wonderful!!!!! I love your dress and your outfit is amazing!!! Wondefull!!! I love your dress and your outfit is amazing!! Great look. It’s so feminine. You are just gorgeous! love your blog! I love these pictures, so beautiful. I wish we celebrated Midsummer’s Eve in the Netherlands..
Oh my gosh…everything is so lovely. Mattias takes such great pictures here Carolina. I love everything! The lace, the lip color, the flower headband…awesome! The dress is really pretty, sort of like a mini wedding dress. My favourite part is the garland. We I see this pictures I can’t help but thinking about fairies, spells and Shakespeare’s “A Midsummer Night’s dream”… They’re simply gorgeous!!! Your dress and your lipcolor are perfection!! I’m in love with white lace dresses, I own a ton. I’m attending a wedding this Saturday and I’m kicking myself because I sure cant wear any of those dresses!! Beautiful pictures, I love them! 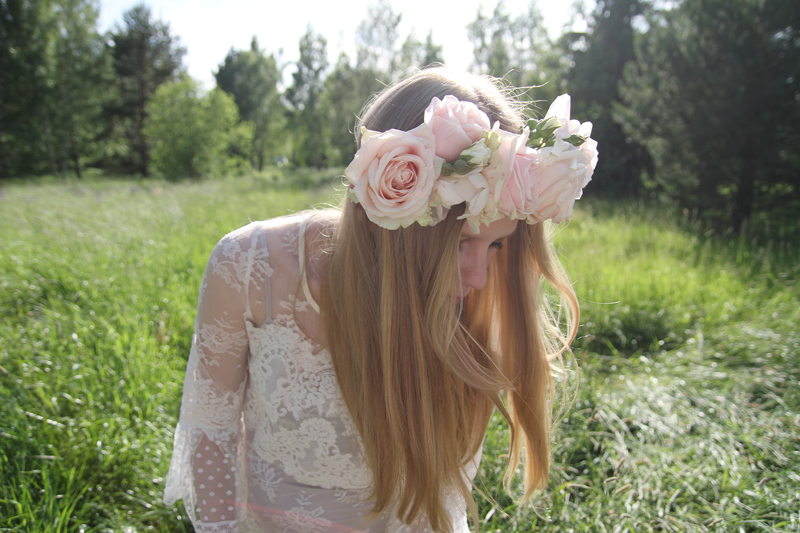 And I also love the flower crown, it’s just amazing! I want to use your headpiece as a wedding bouquet. It’s beautiful. I’m in love with your white lace dress. So vintage looking with a soft, feminine touch. I love your dress! This is so gorgeous! Your photos look like a spread in Vogue! This lace dress is seriously to die for! 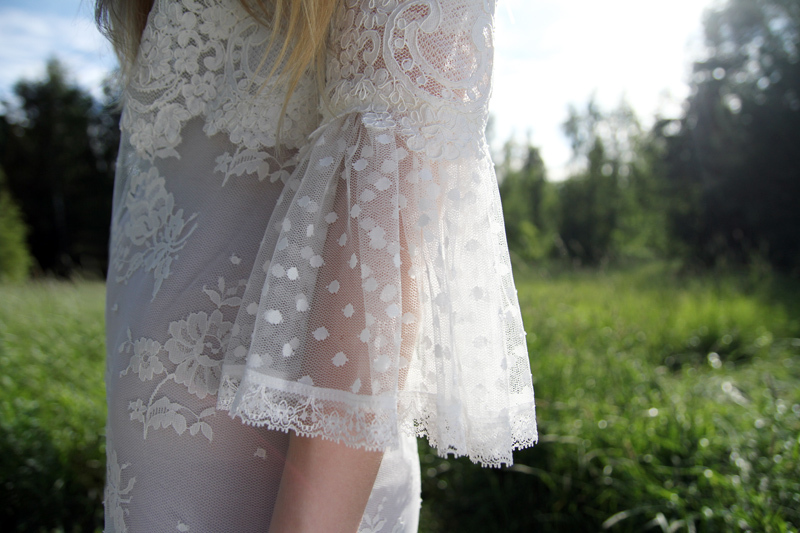 I love the retro bell sleeves that add a boho edge! What a beautiful dreamy pictures with those flowers in you hair. I love your dress! You look simply stunning and ethereal, and the photos are gorgeous. 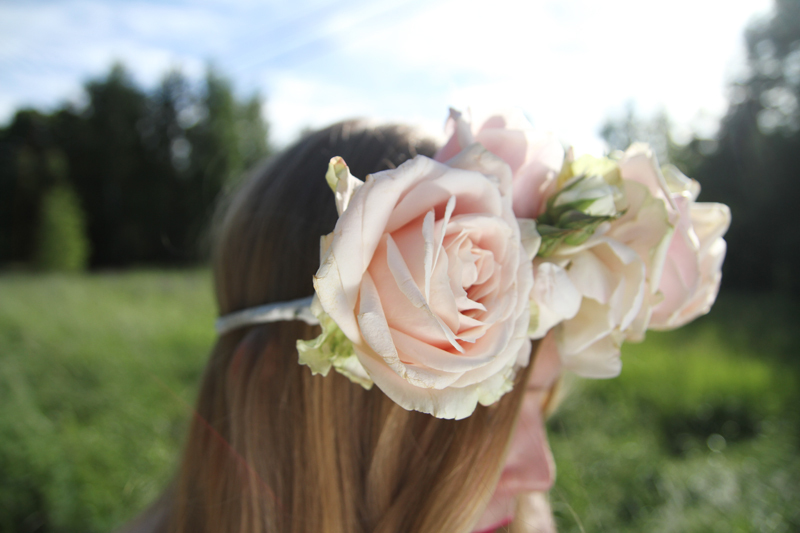 I am sad to find out that you didn’t purchase the flower crown from a store though because it is steller. I want one. Perfect! Love the flower crown. Your outfit here makes for an epitome of the shy and delicate, but gorgeous European summer. It’s not crazy-colored fruit and skimpy clothing, it’s much more subtle than that. Love the wreath, talk about organic fashion! It has to be very difficult to live in a country like yours, i say, all dark in some moments of the years.. Anyway.. you are awesome with this dress. It has a lot of caracteristics of vintage clothes but is very modern also. Incredible. Totally agree with the last sentence – NOTHING is better that Summer in my home country Estonia. It’s the most beautiful thing on this earth and will always be. your look is so hippie, i really like it <3<3<3 it kinda looks like festival look what make it any better!! I love the legend about the flowers!Thanks for sharing. My brother lives in Oslo so I visit Norway from time to time, and have experienced those never ending days. WOW! Amazing shots and lovely dress. Such a beautiful and romantic look – love it! wow this is amazing,love the dress and all the photos…and you,oh you’re just beautiful!! that head piece is so lovely!! I love the color of the lipstick. Can you tell me the label and name of it? OMG! You look absolutely fabulous, like the Titania Queen from a Midsummer night’s dream! Gorgeous photos, love the flower wreath and the light. Makes me miss a traditional Scandinavian Midsommar! Lots of love Bianca in London, from the GoScandinavian Fashion Blog. That flower crown is intense! Love the dress. Awww, the look is absolutely beautiful. Midsummer’s celebrations look so fun! Too bad they don’t have it where I come from. Waw the pictures are beautifuuuul! Love the outfit and mostly the handband! you look like a pretty fairy! Love your makeup! You look so pretty! You look so beautiful!! Love the pictures. beautiful. I love that dress and the whole outfit and scenery is just beautiful. Absolutely in love with your flower crown. You looked lovely in that dress! Love the rose hair piece. P.S. Your dress is gorgeous! what a nice photo shoot..
… love your whole look! WOW ! this photos are amazing ! so pure ! so beautiful ! This look is stunning ! love the flower crown ! You look so beautiful! So cute! Amazing flower! WOW beautiful pictures!! i loved everything in this shoot! hey this look is gorgeous. i love your lip colour! what brand and colour is it? Love these pictures! I also like the story behin midsummer’s eve! It does have something magical! And I do believe you in an instant when you speak about the swedish summers, and although winter is long and cold, I also like scandinavian winters, at least they are real winters, like in fairytale stories ;-) Have a great week! That is amazing! I love your photography ahhh!